This unique genombrottsantiaging formula goes beyond reducing wrinkles, specially created to defy gravity for a superior visibly uplifting and firming results. This unique nattetidsomvandlaren gives extra power to retinol along with the patented NeoGlucosamine ® that enhances the results while a gradual, time-released Retinol maximizes potency and even the tolerance of the highly concentrated formula . Retinol is widely recognized by dermatologist for its anti-aging force. Retinol helps to build up natural collagen and its surrounding support matrix for fullness and firming. It reduces the appearance of fine lines and wrinkles from the inside out. Cell renewal improves and accentuates a smoother skin texture and smoother tone with less discoloration. Patented NeoGlucosamine ® is clinically proven to work extra well together with retinol, to extend Hudes support matrix and improve the firming and smoothing effects compared to retinol alone. Optical brighteners provide direct visibility of smoothing. Glycerin moisturizes and Bisabolol soothes the skin. Free from perfume, parabens and oils. Use in the evening on cleansed face. Apply the product all over your face and neck. The product can be used alone or during a moisturizer such as Exuviance evening Restorative Complex or AGE reverse Night Lift. can also be used on top of e.g. Collagen Triple Boost Serum. Keep the product standing on the lid. 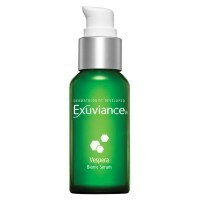 Can Exuviance Super Retinol Concentrate also be used on sensitive skin? Yes, for sensitive skin start by using the product twice a week and increase the gradually up to once per night.